There's just something about seeing those black flecks in whatever you're eating that seems to ramp up that vanilla flavor. And when the flavor is as pure and bright as it is with Nielsen-Massey's Tahitian Pure Vanilla Bean Paste, it just can't be topped. This particular vanilla is renowned for its floral, fruity flavor profile that's often described as cherry-like, and it's a wonderful choice for a cake focusing solely on the presence of vanilla! This is actually my first buttermilk pound cake. I often make them with sour cream, yogurt, or cream cheese, but for whatever reason, I've never used buttermilk. Its tang is definitely detectable, but it's not unpleasant. In fact, it contrasts with the sweetness of the vanilla quite nicely. I also rarely glaze a pound cake, but I couldn't pass up the opportunity to highlight all those vanilla bean specks! So magical. If you want a cake that's dense but moist and absolutely packed with vanilla flavor, this recipe is for you! Interested in trying Nielsen-Massey Tahitian Pure Vanilla Bean Paste for yourself? If it's your lucky day, you can win one by entering using the Rafflecopter below. I'll randomly pick a winner in a week, on April 17th. Good luck--this is a deliciously awesome giveaway! Preheat oven to 325 degrees F and lightly coat an 8x4-inch loaf pan with nonstick spray. Sift together the flour, baking soda, and salt; set aside. In a stand mixer, cream the butter, sugar, and vanilla bean paste together until light and fluffy, about 5 minutes. Scrape down the sides of the bowl as necessary. Blend in half of the flour mixture, then mix in the buttermilk. Finish with the rest of the flour, doing the last bit by hand. Pour the batter into the prepared pan and spread out evenly. Bake for 50-60 minutes, or until a toothpick inserted in the center comes out without wet batter clinging to it. Let cool in the pan for 10 minutes, then remove to cool completely on a rack. Make the glaze by whisking the sugar and vanilla together with enough milk or cream to create a thick spreadable glaze. Add more liquid to thin it down, or more sifted sugar to thicken it up. When the cake is almost completely cool, spread a thick layer of glaze over the top and let it drip down the sides a little. Not exotic, but it was I believe Butter and Nut!!! I just not an exotic person but would love to win the giveaway! I am with you on loving the flecks vanilla beans give in food (though I may have to go with the coffee bean for my favorite bean haha). This cake looks really delicious and lovely! Another brand of Vanilla Bean Paste would be the most exotic extract I've ever tried. Hahahaha vanilla is the best type of bean, you are right! This cake looks lovely & delicious. Bookmarked. Haven't really tried any exotic extracts. Other than the traditional vanilla and almond, I've had coffee, chocolate, lemon and orange extracts. 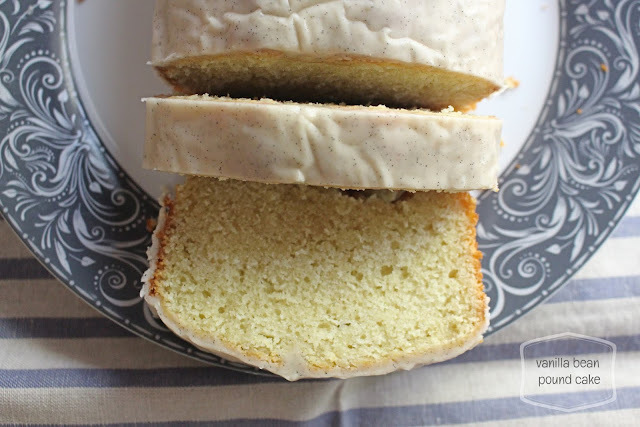 Vanilla beans are absolutely the best kind, and I just adore pound cake. This looks terrific. Anise was the most unusual extract I've used. I've never found you wrong, and when it comes to the best kind of bean I once again have to agree with you! A gorgeous looking cake! I love vanilla too! Love all the vanilla bean flecks in the glaze. This cake looks like the perfect Easter treat -- so ideal to go with a cup of tea or coffee or even glass of lemonade. You make a very good point about picking the best bean! And, what a great-looking pound cake. Love all those vanilla seeds. With the vanilla glaze and the vanilla in the cake, your pretty version sounds delicious.